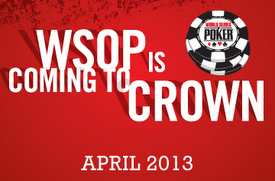 For several days now the Crown Poker team have been hinting to us a big announcement is on the way. Both Crown Poker’s Twitter and Facebook pages have been buzzing with poker players trying to get a sneak peak of what the big announcement was. Anything from rake increases / decreases, bad beat jackpots and an increase in waitresses were mentioned along with possibility of WSOPA … and at 9:36 a.m. AEST on Tuesday morning, Crown Poker and their dedicated team delivered the news many were waiting to hear. The World Series of Poker was coming to Australia and the Crown Poker Room! This agreement that sees the WSOP heading to Melbourne is just the second expansion of the 42-year old brand after the advent of the WSOP Europe in 2007, and with this agreement, there are provisions for international television production of the event which is expected to be shown globally on ESPN. Unfortunately for those wanting to put away some money so that they can take part in an official WSOP event without leaving the country, they’ll have to wait until later in the year when the complete schedule and dates are expected to be announced. Make sure to keep your browser locked to Poker Asia Pacific and like our Facebook page or follow us on Twitter to stay up to date with all the latest news and results from Australia, the Asia Pacific and the world.